I have a weakness for pickles, and more-so when they are home made. This pickle made out of Bimbal is one of my favourites and I love this one made by my mom. These are pictures and recipe I took when mom made it during my last visit. The recipe involves the regular pickle seasonings, but there's something in the way each one makes them. 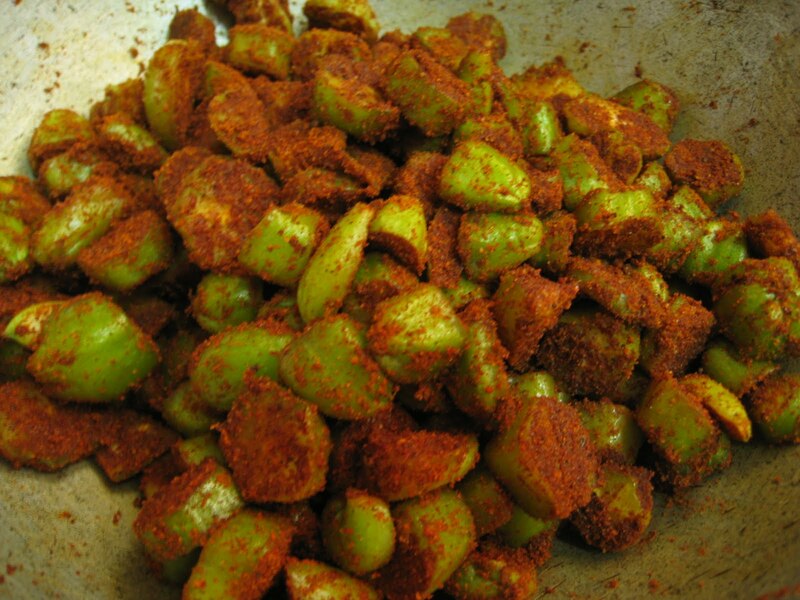 We use this Bimbal fruit/veggie very widely in our cooking, in gravies and pickles. Its a sour fruit and lends the tart/sour base needed in some dals and curries. Read more about Bimbal here. The fruit has to be very firm when used for this pickle. It will not work even if it gets a little soft when making the pickle. Ofcourse, once you make the pickle, it will soften out slightly. Salt - 3 tsp or as you like. - Warm 2 tsp of oil in a small pan. Add the fenugreek seeds, hing, mustard seeds. Once the mustard seeds splutter, add the haldi, black pepper, red chilli pwd and 3 tsp salt. Take off from heat. Once this cools, grind all together in a mixie. 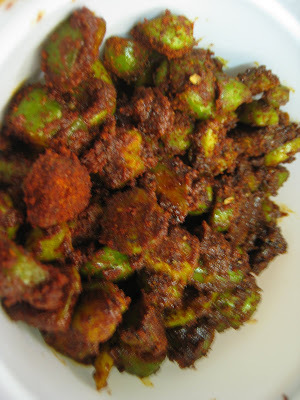 - Add the cut Bimbal pieces to this masala, add the other 4 tsp of oil, mix everything well and keep in airtight bottle. It will be ready to eat the next day. - The shelf life of this pickle is very little. - It will last a few extra days if kept in the refrigerator. - The pickle will ooze out moisture the next day and won't be as dry as when you first mix it. Also, check out the Bimbla Nonche recipe at Shilpa's. 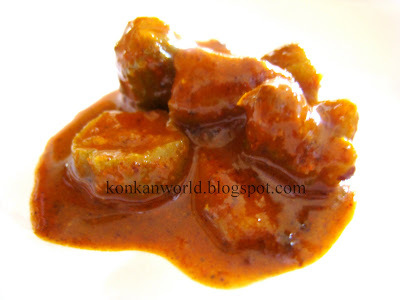 One of the most common curries/gravies made in a Konkani home, is this Tambdi Bhaji randayi, ofcourse when available. 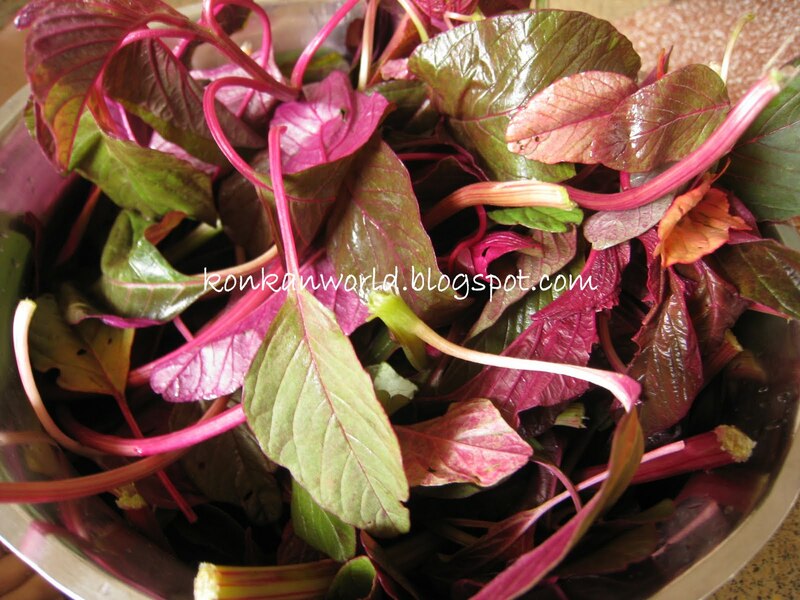 The red amaranth leaves are not only tasty and make a wholesome gravy, but also lend a very nice reddish color to the dish. Both the leaves and the tender stems are used in the cooking. Many different combinations can also be made of this randayi/gravy, but here is the most common one. In the picture above, you will see Vadi's also as part of the gravy. These vadis are sundried items which normally make a great addition to this randayi and some other gravies also. 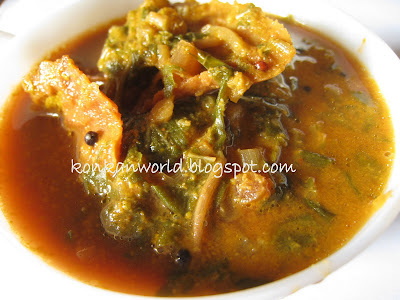 So, here is the recipe for this dish..
- Cook the greens with the dal and enough water for 3 whistles in pressure cooker. - Grind a masala by combining the Coconut, haldi, red chillies, tamarind, coriander seeds and water to make a fine masala. - Once pressure subsides from the cooker, take the greens with dal in a pan and cook it with the ground coconut masala till the rawness from the masala goes away. Add water and cook to adjust the consistency. - In a separate small pan, heat little oil, add the mustard seeds, once the splutter, move them to the side and fry the vadis also in the same oil. Then add this tempering to the pan with cooked greens. - The vadis in the dish are optional but one of the ways we normally make the dish with. - If you are not using the Vadis in the tempering, then temper the dish with mustard seeds, hing, curry leaves and dry red chillies.